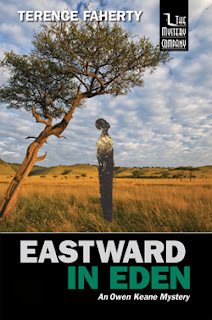 In a recent post I mentioned that the first new novel in my Owen Keane series to appear in fourteen years, Eastward in Eden, will be out this fall. A last-minute delay at the printing plant kept the book from making it to the Albany Bouchercon (where I served on a panel with some eminent Sherlockians and met SleuthSayers guest columnist Herschel Cozine), but barring a reversal of Earth's magnetic field, the book should arrive this week. Owen Keane was the protagonist of my first novel, Deadstick, which was published in 1991. But he and I have been together even longer than that. I created Keane for a short story I wrote for a night-school writing class in 1979. He falls into the category of amateur sleuth, but he's an odd bird even in that very diverse group. Keane is a seminary dropout who compulsively investigates little human mysteries hoping to find clues to the larger spiritual mysteries that haunt him. In Eastward in Eden, those little human mysteries are less little than usual. Keane is in Kenya in 1997, trying to solve the murder of a man who claimed to be the reincarnation of a famous warrior chief. If that weren't enough, the remote valley where the murder occurred is under attack from a group of paramilitary land raiders. Quite the spot for a non-violent ex-seminarian (who never once fired a gun in the series' previous seven titles) to find himself. I can't even claim that Eden is a return to the Keane character in long form. It's the novel I was working on in 2001 when St. Martin's Press decided to drop the series. I stubbornly continued to write the book after I'd gotten the bad news, in part because 9/11 happened and having something to work on was a break from that. Inevitably, the terrorist attack reshaped the book. Two of its major themes became tribalism and the related tactic of dividing people into warring groups in order to manipulate them. So Eden isn't an attempt to revive the series. It's the book I intended as the next title back when the series was a going proposition. When I finished the manuscript, I put it away and wrote other things (including two Keane novellas for Worldwide). Then Jim Huang of the Mystery Company, a good friend to all mystery writers and especially this one, began to bring out e-book and print-on-demand editions of the earlier Keane novels, a process I touched on briefly in a post last May. Jim read the Eden manuscript and decided to publish it. I have no idea whether Eastward in Eden will be the last Owen Keane novel or whether removing that plug from the pipeline will result in a gush of new book ideas, though the smart money has to be on the first horse. Either way, I'm very grateful to Jim Huang for guiding it into print at long last. Very best of luck with Eastward in Eden. Thanks, Janice. It pays to aim for timeless elegance, I always say. And congratulations on "The Psychic Investigator" in the December Alfred Hitchcock. Terry, we wish you well on having taken EDEN out of the drawer and getting it into the published pipeline. Afterwards, any sequels are up to the Muse. Terry, I'm glad we could connect at B'Con. Just wish we had more time. Good luck with Eden. R.T., Thanks for the good wishes. Herschel, I'm sorry we didn't have longer to talk at Bouchercon. I hope you enjoyed the panel.